On 19th March, Artha Forum (a Not for Profit initiative dedicated to bringing relevance of Ancient Wisdom in Modern business) organized its 6th and largest ever event in Singapore at RELC International Hotel on the heels of successful event in January of this year. The event titled “Earn with Integrity, Spend with Compassion” was very well attended with over 400 attendees from all walks of life joining the event, which was partnered with TiE Singapore and IIMPACT. The attendees, many of whom have attended multiple Artha events in past, included entrepreneurs, industrialists, corporate leaders and professionals. World renowned spiritual teacher, author and motivational speaker His Holiness Radhanath Swami was invited to be the keynote speaker for the event. Esteem panelist Rajiv Vij – Life and Executive Coach, Author and Speaker; Srinivasan Venkita Padmanabhan – President & Global Head Finance at Olam Group, Madhabi Buch – Director at Agora Advisory and Sanjiv Aiyar – President of PAN IIM Alumni and a longtime supporter of Artha Forum shared the dais. Radhanath Swami started his keynote by mentioning a famous quote “If you want to feel rich, just count the things you have that money can’t buy.” Reflecting on the current state of the society he said that earlier people used to love people and use things to express it. But now people are loving things and using people to get them and keep them. He said that “Things can give some flickering pleasure to the body, senses and to the mind but the things can never give fulfillment to the heart” He recalled his discussion with Mother Teresa where she mentioned that the true hunger of today’s world is not the hunger of stomach but it’s the hunger of heart. Radhanath Swami cited the example of New York Yankees baseball Manager Joe Torre who lead one of the most successful baseball team and went on to become top five manager in the history of baseball in US. Having gone through a very difficult childhood filled of abuse and violence, after he retired Joe started working with ghettos school to give counselling, guidance and therapy to the children from abusive families. In his own words Joe said that the true happiness was not from the awards, money and fame that he has earned but rather the smile which he sees in the faces of these children. Radhanath Swami narrated the story Easy Eddie who worked as a lawyer for Al Capone, an American gangster who attained fame during the Prohibition era. Easy Eddie had all the opulence and wealth but he realized that it had not brought any happiness to his son. Coming to the realization that he had failed to give his son true values – and all the wealth he had was stained with exploitation and murder, he decided to go against Al Capone. He was able to convict Al Capone for tax evasion – for which he paid a heavy price of being shot to death in his car. Inspired by Easy Eddie’s sacrifice, his son Butch O’ Hare went on to became the first naval recipient of the Medal of Honor in World War II who single-handedly attacked a formation of nine heavy Japanese bombers approaching his aircraft carrier and saved it and later on went on to give up his life fighting for his nation during the war. The event ended with thoughtful and intriguing lineup of questions which were posted in real-time during the sessions via newly launched mobile site. 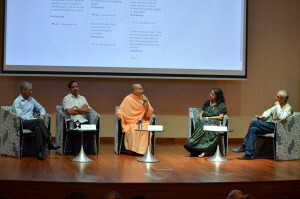 Both Radhanath Swami and panelists fielded the questions and gave very practical responses on how to take back topic of the event to one’s day to day life.